The opening of GLOW today (Friday) kick starts the city’s seasonal celebrations, and with them a promotional drive by Cork City Council and the Cork Business Association to encourage people to come into the city centre and to shop locally in the lead-up to Christmas. Attended by over 160,000 people in 2017, GLOW will run every weekend in the build-up to Christmas, and also Christmas week from Thursday December 20th to Saturday December 22nd. As part of GLOW, enjoy fantastic views of Cork City on the 30m Ferris Wheel, sample delicious food at the Christmas Market and listen to beautiful music by Cork choirs and bands on the Grand Parade. No trip to GLOW is complete without a visit to Bishop Lucey Park which will be magically transformed into an historic Christmas wonderland based on the theme of ‘The Night Before Christmas in Old Cork’. Prepare to be amazed – enjoy a nostalgic and engaging experience in a traditional Christmas atmosphere. Visitors will enter Bishop Lucey Park through an ice tunnel where they will be greeted by a Chirpy Snowperson as they stroll through streets reminiscent of a Medieval village. Visitors can look through the windows of Santa’s house where Santa Claus will be sleeping in preparation of his trip to Cork with Rudolf contently dreaming at his feet. Make sure to visit the Old Post Office “Teach Phadaí Fear an Phoist” where Padaí the Postman will show children where they can post their important letters to Santa Claus. 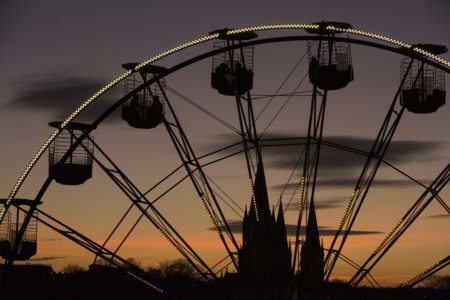 Bishop Lucey Park has been magically transformed into ‘The Night Before Christmas in Old Cork’ by Triangle Productions, a well-known Cork based event creation and management company. Triangle Productions specialise in artistic creations design and architecture, sets for theatre as well as major event planning and safety throughout Ireland. A host of wonderful musical performances will take place on the Grand parade throughout the event. Organised by Cork City Council and in partnership with Music Generation Cork City, these will include amongst others Carrigtwohill Gospel Choir, Cork City Male Voice Choir, Cork City Musical Society, GLÓ Trio and Barrack Street Youth and Junior Band. Like most Cork City Council projects the opening hours are complicated. Bishop Lucey Park will be open on these dates from 4.30pm to 8.30pm. The Christmas Food Markets on the Grand Parade will be open from 12noon to 8.30pm. The Ferris Wheel will be open each day from 12noon to 9pm. Will today’s busy public remember all those times? No, but fear not, basically get yourself down to the Grand Parade over a weekend and some one of the elements will be open!